During her book signing session of ‘Stupid in Forever More’ on October 13, Senator Miriam Defensor Santiago announced that she will be running as a a presidential candidate in the 2016 elections. When it comes to her running mate, Satiago shared that she will be running with someone who has already publicly announced the candidacy. She will still be running under her party People’s Reform Party, the same party she had run with during her 1992 presidential bid. Santiago shared to the media present in the event that she envisions the country to be better if she becomes the next president. Unless the cancer comes back, she has decided to run as there seems nothing left to do. She had been serving the government since the beginning and she thinks that it is fit to end her career as such. It was only in July 2014 when the law maker announced that she was suffering from a Stage 4 lung cancer, and after a year she declared that she was cancer free. 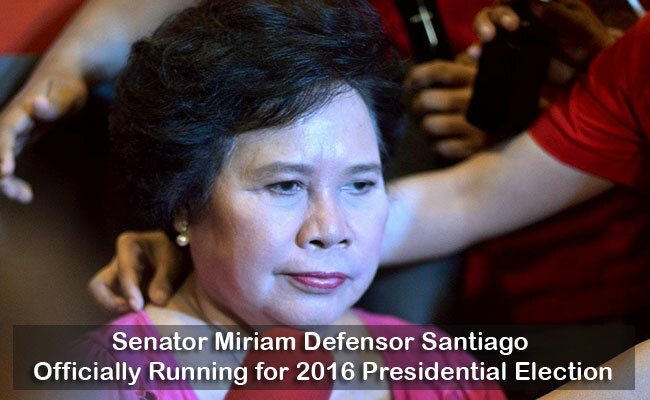 Together with the announcement of her regaining health, she shared that she might be running for presidency. As for her running mate, the senator refused to named him, but had had already declared his candidacy for vice president. As for now she would keep the information private because his wife might scold him. Recently, there are only three vice presidential bids who had not announced their running mates: Alan Peter Cayetano, Antonio Trillanes IV, and Ferdinand "Bongbong" Marcos Jr.
Cayetano was vocal about wanting to run with Davao City Mayor Rodrigo Duterte, but the mayor had announced that he is not even motivated to run for the highest seat. Trillanes on the other hand had shared that he is willing to support Grace Poe despite her running with Chiz Escudero as her running mate. The lawmaker also did not reveal her senatorial list and even challenged the media to guess who they will be. She also did not say when she would file her COC. In the recent Standard Poll, the law maker placed 7th among the 8 candidates in a survey conducted by Laylo Research Strategies. The survey was done from September 21 to October 1. This is the third time the senator will be running for the highest office in the government and Malacanan Communications Secretary Herminio Coloma Jr said that this gives the voter a wider choice. Santiago served in the government in all three branches for more than 20 years.